Adams School, built to serve the West End neighborhood, was perched on a granite hill overlooking Rice’s Point. The school was named for a President Adams, but records do not indicate if the namesake was John Adams, the second president, or John Quincy Adams, his son and sixth president — or both. The brick school stood three stories high and featured a square tower and some arched windows and entrances. 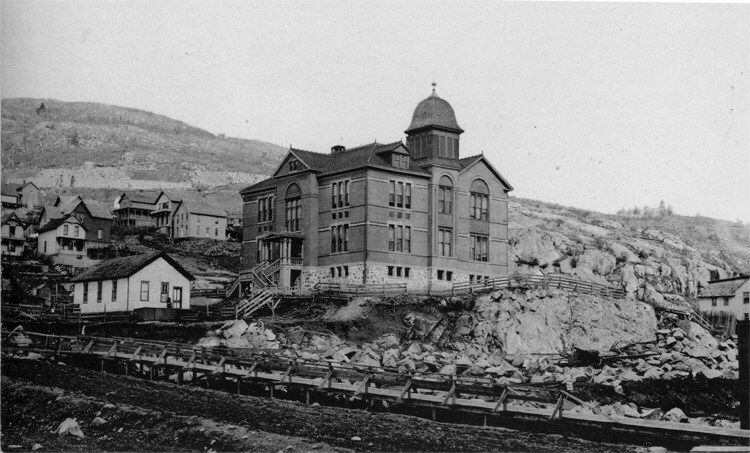 Originally Adams had eight classrooms, but an 1891 addition designed by McMillen and Radcliffe increased it to fourteen. When the building closed in 1951 its 280 students transferred to Lincoln School. In 1962 excavation contractor Harvey Grew purchased the building from the school district for $100, planning to raze the building and create a parking lot. Three years later he regretted the purchase and offered the building and land for free if a new owner would use the property for a public purpose. There were no offers. 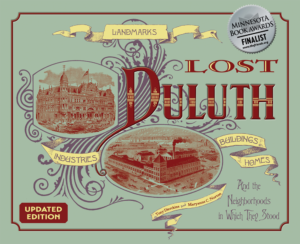 In 1965 the Duluth Herald called the building “the city’s No. 1 eyesore.” Adams (shown in 1886) remained vacant until 1968 when it was demolished. Its rock retaining wall remains.